LAS VEGAS (AP) — Republicans’ chances of keeping their majority in the U.S. Senate have become shakier as races in red states such as Texas have tightened, but the party’s most vulnerable member insists he’s bullish about his re-election in Nevada. 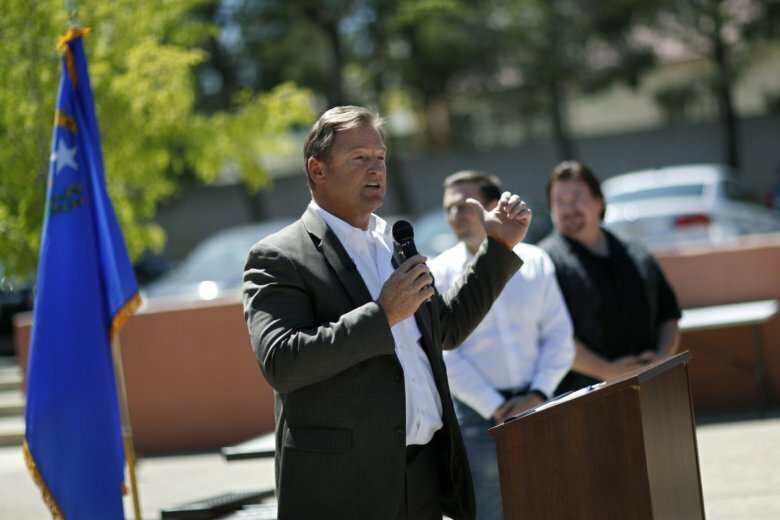 Sen. Dean Heller has faced tight races before but never lost an election. He’s now in the fight of his career to keep his Senate seat in a blue-trending state that Hillary Clinton carried in 2016. Heller once said he “vehemently” opposed Trump and returned one of his campaign donations, but at a campaign rally in Las Vegas on Thursday night, he and the president heaped praise on each other. Heller has formed an alliance with Trump after drawing the president’s ire last year when he held up Republican efforts to repeal former President Barack Obama’s health care law. Heller on Thursday credited the president for improving the economy, the U.S. Department of Veterans Affairs and the job market. “Mr. President, it’s an honor to work with you and put Nevada back to work,” Heller said. Heller is now in a tight race with Democratic Rep. Jacky Rosen, a first-term congresswoman who stands to benefit from a wave of Democratic and female activism fueled by opposition to Trump. Voters on both sides of the aisle know the Nevada race is key for Democrats trying to flip control of the Senate, he said, and the big question will be whether they view the race through a national lens and make it about Trump or just consider Heller’s record. The Nevada Independent and The New York Times reported that Heller on Wednesday described the furor over sexual assault allegations involving Kavanaugh as a “hiccup” and that the judge would ultimately be confirmed.